Nothing is more eco friendly than wedding dress cleaning with water. Let Heritage Garment Preservation professionally wet-clean your wedding gown for the most thorough cleaning with the least environmental impact. Our Museum Method™ gown preservation is also the “Greenest“ Gown preservation method available. Water is the most renewable resource we have on earth. Water is the best cleaner for most stains. Most wedding gowns can be safely hand cleaned with wet process. Museum Method™ wedding gown preservation utilizes cotton bags, cotton padded and cotton covered hangers for our preservation. Cotton is a more renewable resource than paper, as cotton plants are not cut down when the cotton is harvested. 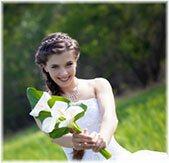 Get your Free Estimate for your Green wedding gown cleaning and preservation. Then select service package and preservation choice and add to our cart. You can choose to “Pay Now” or “Pay later or Set up payment plan” during checkout. You may also prefer DIY wedding dress cleaning and preservation. Buy our Do-it-yourself kit and save. Looking for a earth friendly wedding gown? Or would you like to sell your gown? Visit www.ecoeleganceconsignment.com for used wedding gowns.